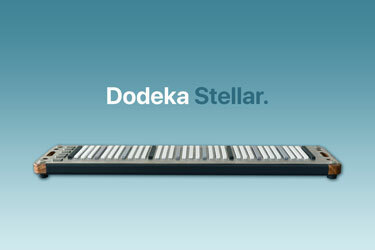 A 3-octave MIDI controller, featuring Dodeka's unique keyboard design that is set out to revolutionise your music in a big and profound way. Designed with the new generation of musicians in mind, the Stellar is the perfect instrument for those always on the go who want to explore music in a new way. Its unique linear keyboard layout opens up a whole new dimension, where music is equally spaced and creativity has no limit. With the Stellar, musical possibilities are endless. We put together a great piece of hardware. Here are some of the technical specifications. Want to know more? Check out the stellar page. If you are as excited as we are, you can now pre-order your Dodeka Stellar. So far, we’ve only built a working prototype of the Stellar, not the final product. To build it we plan to carry out a crowdfunding campaign in the coming months. But for that to happen, we need at least 100 reservations before launching the campaign to justify the costs of manufacturing and make sure that we can deliver your keyboards on time. We estimate the unit price for the first batch at $350. Pre-order yours now here and share with your family, friends and fellow musicians.